les écoutis le caire‘ is a dual work that comprises a sound composition by Gilles Aubry and a poetic text in French by Stéphane Montavon. Materials for both elements were collected during a six-week residency in Cairo in February and March 2007. 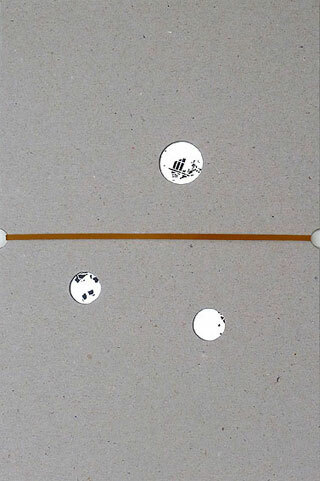 The sound piece is based on the principle of ‚indirect listening‘ to a busy city soundscape. It features recordings of several enclosed spaces chosen for their resonant properties and predominantly silent contexts : a bathroom, a market hall, a basilica, a courtyard, a refrigerator and a parking house. Throughout the piece the identification of the sound sources remains uncertain, as the distant hubbub of life in the streets diffuses inside the recorded spaces. Such ambiguity – further extended through the editing process – requires that the listener pay closer attention, and at the same time allows for a more intense musical experience. This release is part of a label series devoted to field recordings, though the latter only constitute the groundwork of something more comparable to a minimalist opus than a collection of acoustic landscapes. Indeed the way in which Gilles Aubry processed and seamed voices and urban noises from Cairo – taped in 2007 during a residency – tends to exploit the canorous properties of the local activities, disposed according to criteria of rhythmical reiteration and mind-cuddling resonance with just a slight addition of electronic frequencies. Mixing the results in two separate pieces, Aubry shows us useful shortcuts in a neighborhood where failure is right behind the corner. We can choose among different listening methods: focusing on the discovery of hidden details, or using the record as a source of pleasingly insistent metropolitan textures to match a particularly meditative phase of a quiet evening (I confess of having fallen asleep at some stage in the first try). 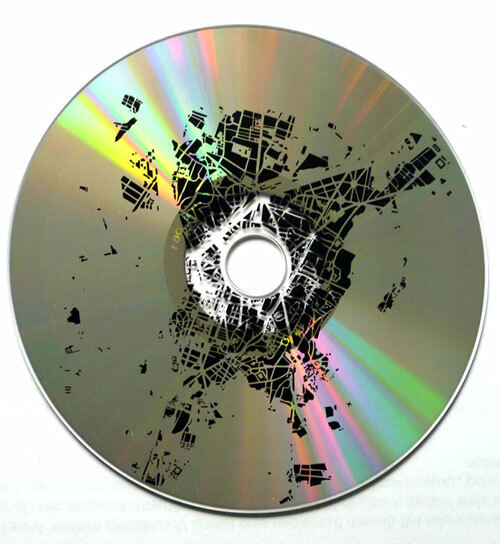 The CD is complemented by a sizeable “wordmap” containing Stéphane Montavon’s text about the “audiovisual discrepancies” of the situations encountered in the city throughout the staying period. Written in French – a language unfortunately never mastered by this reviewer – the document contributes to an artistic assertion that deserves attentive appraisals before the emission of a definitive verdict. My gut feeling is one of concord, reinforced by consecutive spins. Les Écoutis Le Caire (roughly translated as The Listeners of Cairo) is deeply immersed in the sounds of the Egyptian city, capturing, burrowing into and amplifying heterodox audio sources into a multi-layered, densely textured cacophonous document. 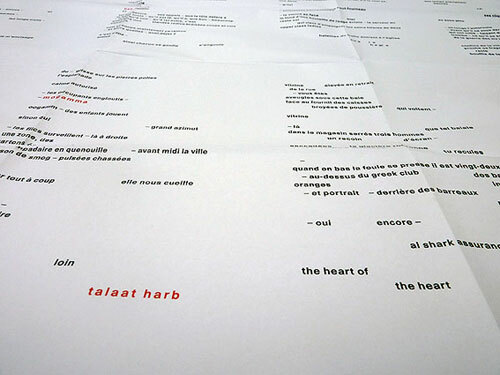 Sounds were collected by Gilles Aubry while Stéphane Montavon worked on text, during a six-week residency in Cairo in February and March 2007. Editing, montage and resonance are the main elements at work in these two similarly structured nearly half-hour long pieces. Aubry focused on a number of enclosed spaces: a bathroom, a market hall, a basilica, a courtyard, a refrigerator and a car park. These sources remain abstract, with the focus brought to the distant din which bleeds in on and overwhelms these spaces, random detritus, confused urban noise in all its frenzied forms. A howling, hissing drone seems to wind through both tracks, functioning as an anchor of sorts, around which finer details emerge and retreat: whistling wind, trickling water, indistinct chattering, honking traffic. Frequently the noise is overwhelming, not in the sense of harsh volume but of overcrowding, of there being too many elements to absorb. At other times it becomes music, cars swinging doppler effects like strings, voices taking on tonal form. Both works trail off into pleasingly bucolic finales, birdsong accompanying calm, spacious pockets of activity, possibly sourced from a suburban picnic, reminding listeners that it’s not all go in Cairo. The packaging is particularly lavish, making for an attractive alternative travel guide for anyone visiting the city. Anyone who’s lived in Cairo can tell you this: between 5 a.m. and 7 a.m., it is the most beautiful city in the world. Driving through the rarely empty streets or a walking along the Nile without being bothered by the car exhausts and inhumane noises is an experience that is highly recommended by all peace seeking Cairenes. But then again, that is not what the Cairo people endure on a day to day basis, and it is definitely not the Cairo that Gilles Aubry has caught on tape on this album. Les Écoutis Le Caire (roughly translated as The Listeners of Cairo or Cairo’s Listeners) is two nearly half-hour long pieces of layered field recordings made in 2007 by Aubry when he resided in Cairo, accompanied by the poetry of Stéphane Montavon*. I’ve lived in Cairo all my life, and initially thought that any attempt to capture the city’s essence on tape would be destined to fail. Not to underestimate Aubry’s abilities, but the amount of entangled sounds, noises of all forms coming from all surroundings, and sheer cacophony of the whole place is just too much to portray in an hour-long recording, not to mention making something meaningful out of it. Surprisingly enough, these artists were able to make it happen with their blend of music and accompanying text. They have been able to achieve an extremely difficult feat and portray the city in a manner that hasn’t been done before. The key to this work’s success is the amazing job that was done in cutting, pasting and placing the recordings. An additional embellishment comes in the form of a wind tunnel effect drone that runs throughout the length of the album (and which was actually recorded inside a ventilation duct). It acts as a muffler, a nod to the overpopulated metropolis, a gate which allows each sound to pass at exactly the right time. This enhances the feeling of distances, of locations, of some things coming closer while others disappear in the distance. This drone is Aubry’s mind in action, our insight into how he thought about the album, or his technique of “indirect listening”. It’s very hard to tell what is happening at each exact moment but the listener gets a feeling of standing and drinking in the surroundings. Aubry’s decision to take samples mainly from Cairo’s downtown area (confirmed by the names of the streets in the attached text) is worthy of applause, as downtown Cairo is an area of stark contrast and rich history. The old campus of the American University, home to the richer Egyptian youngsters, lies next to a rundown, covered souk, and is one of his sound locations. Honorable testaments to Greek, French, and Italian architecture stand opposite repulsive post-revolution slabs of cement. But most importantly, with the area being at the heart of the city: traffic! Lots of it. Immense numbers of cars in tiny streets that, in turn, lead to a huge number of angry commuters, and an onslaught of cussing and yelling. These elements allowed Aubry to gather diverse and accurate recordings, providing Montavon with the inspiration to write his eerily strange but beautiful guide. It is actually a bit scary how accurate the experience of listening to this album is when compared to the real thing. I have listened to it while walking, driving, and while standing on my balcony, as forms of experimentation, and every time, after the album has been playing for a bit, the sounds blend in perfectly with the streets and noises. Les Écoutis Le Caire is a testament to the power of music and words to capture real life perfectly without a single photo or form of visual aid. The artists have provided a taste of Cairo’s unique spirit and a truly engaging work of art. I would recommend this to anyone who’s never been to the city, as a means of insight; and to those who’ve lived their entire lives here, to give them something to remember and appreciate it by. One question remains, how come none of the Egyptian musicians ever thought of doing that? Oh yeah, they were busy covering Pearl Jam. *Another very good accompaniment to the album are the poems by Egyptian poet Hoda Hussein which describe the journey. You can find those here. Dit hier is nog een knutselwerkje waarvan de som van de delen een prachtig totaalkunstwerk vormen. Eerst en vooral hebben we de eenvoudige maar in het oog springende -want atypische- rechthoekige kartonnen verpakking. Daarin vinden we naast de CD ook nog begeleidende poëzie, zonder verdere opsmuk gedrukt op groot posterformaat. Die poëzie is van de hand van Stephane Montavon en omschrijft -in het frans- diens beschouwingen over diens verblijf in Caïro. Reisgezel was geluidskunstenaar Gilles Aubry, die tijdens tochten door de stad veldopnames maakte en deze later bewerkte tot een soundtrack voor een stad. Als echte ambientmuziek laat het je aandacht afdwalen om uiteindelijk toch steeds aanwezig te zijn. Je waant je zo in een of andere stad en inderdaad: wanneer we door de straten wandelen dan zouden we bijna onbewust deze geluiden horen. Je ziet de denkbeeldige stad a.h.w. aan je geestesoog voorbij gaan. Als je daar dan ook de teksten van Montavon bij neemt dan ben je zou vertrokken voor een auditieve en intellectuele wandeling door De Stad… Krachtig in zijn eenvoud!! A simple white sheet, 51 by 84 centimeters, with the poetry of Stéphane Montavon spread over it. The CD is basically environmental field recordings, made by Gilles Aubry in Cairo, Egypt, in a bathroom, in a covered market, in a basilica and in a courtyard. Finally, other „audio catches“ that can be traced to a refrigerator and a parking house, all gathered in a large box made of rough thick cardboard, held together by a coarse rubber band. The titles, the authors’ names and the other information are just engraved, without any ink. Why such meticulous care? Why are such seemingly random and inessential elements combined into a single project? Shaky sound sources, confused mumbles, fragmented juxtapositions, all contribute to the challenge, to the ambiguity of the data, in a multi-faceted and fascinating editing process. The indeterminate prompts us to pay more attention, the mediation between what is unusual and what is less so, favors – ultimately – the creative development of new ideas and plots. Entre deux plaques de carton gris, Gilles Aubry et Stéphane Montavon ont dissimulé Les écoutis Le Caire. Avec, il y a aussi un poster-poème « moderne » conçu par Montavon dans l’idée des calligrammes, c’est donc à dire : beaucoup moins « moderne » qu’il n’y paraît. Beaucoup moins « moderne » que le disque de field recordings qu’il cache en tout cas. Sur ce disque, il y a inévitablement des bruits. Des bruits de la ville qu’est Le Caire aujourd’hui (tentaculaire, étendue, inembrassable d’un coup d’un seul, que ce soit du regard ou de l’oreille). L’auditeur que nous sommes tombe sur une allée au trafic dense ou sur un chantier certainement ralenti par la chaleur. Plus loin, c’est le bruit que font des machines ou des radios qui vomissent des voix ou crachent des mélodies insensées. Et puis tout à coup, une douce musique prend le dessus sur ce fatras magnifique, elle le transforme, le rythme. On ne sait trop comment Gilles Aubry et Stéphane Montavon ont agencé toutes ces preuves de réalité. Mais elles se trouvent là, sur un partition musicale surprenante, et même très belle. The most vivid thing I’ve heard from Gilles Aubry. This field recordist usually invites us to explore static sound spaces for long stretches of time. But not this time. 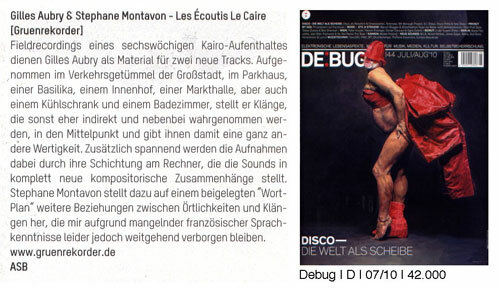 Les écoutes le caire features two half-hour tracks, both made of overlaid field recordings weaving dynamic and active webs of sound, even though the sources are closed spaces. A developed, mature piece of work enriched by poems by Stépane Montavon, presented in a booklet/poster that reads like a road map that (mis)guides your mind as the sounds go by. I must point out the packaging; two pieces of embossed cardboard held together b¥ a rubber band. Simple, stripped down, esthetic. Le disque le plus vivant que j’aie entendu à ce jour de Gilles Aubry. Cet artiste sonore de field recording a tendance à nous laisser explorer des espaces sonores statiques sur de longues plages de temps. Pas cette fois. Les écoutes le caire propose deux pièces d’une demi-heure, toutes deux des amalgames d’enregistrements de terrain qui tissent des toiles dynamiques et actives, même s’il s’agit d’espaces clos résonants. Un travail poussé, mûr, et enrichi par les poèmes de Stéphane Montavon, à lire dans un livret-affiche comme une carte routière qui guide (et déroute) l’esprit au fil des sons. À souligner aussi: la présentation: deux morceaux de carton embossé réunis par une bande élastique. Simple, dépouillé, esthétique. Swiss sound artists Gilles Aubry and Stéphane Montavon have collaborated in different projects exploring field recordings techniques. 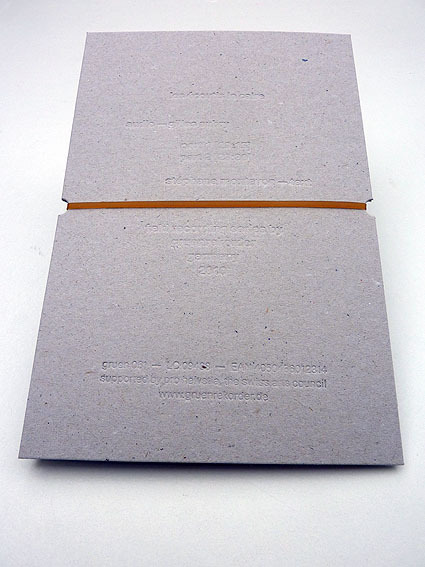 „Les Écoutis le Caire“ is printed in a rectangular cardboard that comes with a French text in the inner sleeve written by Stéphane Montavon with Aubry field recordings taken from urban places in Cairo. Not only pure recordings but some of them are processed which contain voices, sounds of cars, claxons, noises of metal beats, jackhammers like and some others barely identifiable. The idea of repetition is always present here with voices, dialogues or other noises such as claxons, an attempt to stick to the memory the claustrophobic sensations of overpopulated cities nowadays. El artista sonoro suizo Gilles Aubry y Stéphane Montavon han colaborado en diferentes proyectos explorando las técnicas de grabaciones de campo. „Les Écoutis le Caire“ está editado es un cartón rectangular que viene junto a un texto en francés escrito por Stéphane Montavon con los registros de campo de Aubry capturados de lugares de la urbe de El Cairo. No solo hay grabaciones puras, sino que algunas de ellas están procesadas que contiene voces, sonidos de automóviles, bocinas, ruidos de golpes de metales, retroexcavadoras y algunos otros poco clasificables. La idea de repetición aquí está siempre presente con voces, diálogos y otros ruidos como bocinas; un intento para “pegar” en la memoria la sensación claustrofóbica de las ciudad sobrepobladas de nuestros días. In a very nice cardboard sleeve we find a CD (by Gilles Aubry) and a large poster with a text in French by Stephane Montavon. I am sure lots of people speak or read French, but there are more who don’t. So it eludes me why this is part of it. No doubt there is a relation to the two pieces on the CD, which were recorded during a six week stay in the CD. Aubry taped the busy city from within rooms with ‚resonant properties‘: a bathroom, a market hall, a basilica, a courtyard, a refrigerator and a parking house. You hear the city, but its always a bit remote, a bit far away, a bit blurred. Its not a strict fifty minute recording here, but Aubry has made a collage out of these recordings, superimposing them (which means he layered a few), in order to further blurr the effect. The humming of machines, walking and talking of people, cars passing far and above. Like a beautiful day – like today actually – when the window is open and sounds from outside leap into your environment. I have not been to Cairo, but I can vividly imagine it would sound like this. I am not sure if two is more than one here: both pieces seem to have a similar approach, which makes perhaps the second one a bit superfluous. Not always more equals better, and in the limitation one can show beauty too. But through a pretty good release, musicwise. I can judge about the text, but a translation would be welcome, I guess. Gilles Aubry provides claustrophobic urban field recordings brought back from certain enclosed spaces, showcasing them on Les Écoutis Le Caire (GRUENREKORDER GRUEN 061) over two lengthy suites of edited material. Amongst these intensive and crowded rumblings, the sense of despair is only barely kept at arm’s length, and even hardened city dwellers such as myself blanch at the harsh realities with which this French Swiss audio composer confronts us. 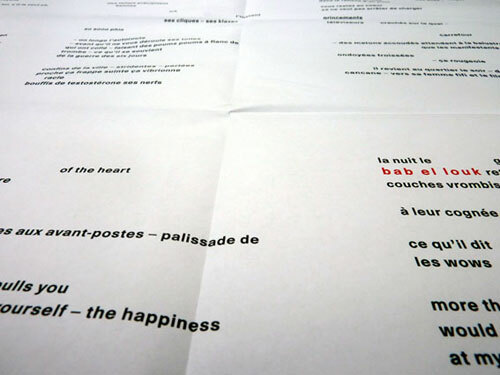 A counterpoint of sorts is provided by the words of Stéphane Montavon, printed in harsh red and black typography on a paper which had been folded up and inserted into the release as a ‘word map’. How Situationist! Although it’s not explicitly mentioned in the press notes, I expect this entire package, with its blind-letterpress card cover and circular holes cut in the back for purposes of revealing key words in the word-map, is intended to be used on your next psychogeographical stroll (or dérive) around the city. La justesse de ce pari artistique est de combiner les trois dimensions fascinantes du Caire : le son, le temps, l’espace, dans une très intéressante proposition, sous élégant cartonnage, d’un poème poster de Stéphane Montavon et d’un CD de musique acousmatique de Gilles Aubry. Avant toute chose, plaisir musical, une métropole s’écoute : elle se livre dans le son que la vie produit, qui a formé profondément l’enfance de ses habitants, qui les tient ensemble, qui les lui attache, qui rend étranger l’étranger. Le son du Caire dit la puissance de cette ville, un son flux, épais, continu, variant de hauteur selon les heures, pas de rythme, charriant des éclats, des pointes, des crêtes à l’intérieur de sa pâte constante. Les Écoutis Le Caire sont le produit de deux écoutes, celle de Stéphane Montavon, auteur d’un poème qui se présente comme une constellation de paroles autour de lieux phares de la ville, le vieux marché Bab el Louk, le Mogamma, bâtiment administratif qui fait repère pour les touristes et les taxis, etc. ; et celle de Gilles Aubry, compositeur de deux pièces de musique acousmatique, à partir de sons concrets enregistrés dans la ville. La particularité de la musique acousmatique, musique produite sur ordinateur, donnée en concert par des haut-parleurs, non pas par des interprètes, est de mettre en relation l’auditeur avec le son lui-même, le son comme une matière comportant sa propre consistance, ses accidents, ses volumes, ses valeurs, ses formes, sa sculpture, son espace, son paysage, et c’est une très belle façon de goûter Le Caire, que cette double composition qui installe d’abord un souffle, peu à peu respiration, c’est-à-dire rythme, durées qui se succèdent sans rupture, par de subtils éveils de hauteurs, par des réverbérations qui lui donnent une profondeur de champ, qui introduisent la perspective, autrement dit l’espace, dans le son, puis par l’arrivée de voix, à l’intérieur de ce souffle continu qui varie, dont on écoute différemment les cycles, qui se déploie puis diminue, se défait de ses éléments, jusqu’à un moment de rupture qui marque la limite entre le corps du morceau et la fin qui dépose le son peu à peu, calme, corbeaux, voilà. Et dans cette continuité, le temps du Caire, mélopée de la ville, flux, lié, indivis, sans tranches horaires. C’est Le Caire, oui, c’est le Caire, cette musique, le son des balais, le son des chantiers, les sons de l’artisanat qui se travaille dans la rue, les klaxons, bien sûr, identité du Caire, mais travaillés avec discrétion, en décalage du cliché, c’est Le Caire mais cette reconnaissance n’est que le bonus d’une musique, riche et forte, qui s’écoute pour elle-même et à laquelle, en contrepoint, le texte spatialisé apporte une construction par ruptures. Fait d’éclats, d’énonciations multiples, d’énoncés tronqués, disparates, le texte dit la pénétration du singulier par le commun, la fragmentation de la continuité, de la pensée, de la parole, de l’existence, dans cette ville qui la rend impossible et malgré l’impossible, malgré l’entrave, d’une vitalité passionnante, ce que le texte dit, dans le chahut des paroles qu’il fait surgir du blanc qui les coupe. les écoutis le caire, the latest release in Gruenrekorder’s always captivating Field Recording Series, is a dual project involving a sound composition (premiered on Deutschland Radio in 2009) by Gilles Aubry, a Swiss sound artist currently residing in Berlin, and a poetic text in French by Basel, Switzerland-based Stéphane Montavon. 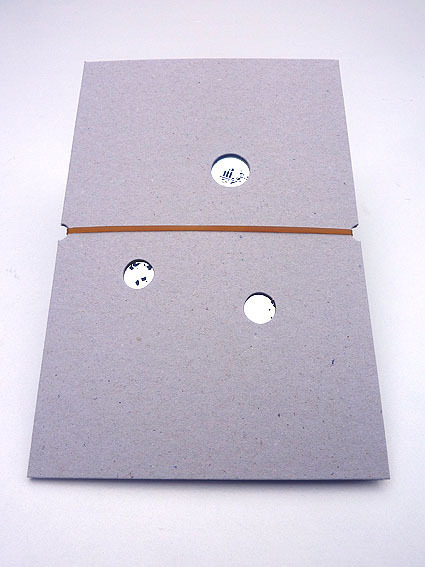 The CD, which arrives housed within a large-format cardboard case with die-cut circles punched out of its cover and blind embossed type on its backside, features two long-form settings (a half-hour and twenty-four minutes, respectively). The opening piece is a half-hour sound portrait of a busy city where public transit systems and blaring car horns jostle for position and crowd into a mix that draws from recordings collected in Cairo at a bathroom, market hall, basilica, courtyard, and parking house. The source materials lose their identifiable character as they blur into a huge, rumbling mass of relentless, hyper-intense activity. It often sounds like what one would expect to hear were a microphone placed at the center of a city’s busiest intersection at rush hour and the results amplified to their fullest. Halfway through, the transit-related intensity retreats slightly to allow voices to emerge more clearly—not that there’s any lessening of intensity in general terms as surrounding the voices are hydraulic emissions of the kind one might associate with steam machinery. Aubry gradually brings the intensity level down as the piece enters its final minutes and as he does so the individual sounds come into clearer focus, even if only briefly. Track two unspools in a percussive rumble, rather reminiscent of the agitated rattle of an old car engine. Speaking voices and waves of abstract sound keep up a constant, unwavering churn throughout the piece until it too grinds to an abrupt halt. Montavon’s contribution to the project is in the form of a large fold-out poster or word-map whose French text is laid out in a spacious, rhythmical manner that reads like a visual counterpart to the sonic pieces. Images and sounds weave through the text to form a word-tapestry that complements Aubry’s material—an alternate way, then, to ‘listen‘ to the city. Now here is an interesting, and in no small amount embarrassing little situation. A couple of weeks back a CD arrived here that I have played a few times over the last couple of days and quite enjoyed. Nothing unusual there. The problem was, as I initially wrote this post, I had no idea what it is called, or what label it is on… The thing is, it is a disc that has no type on the actual face of the CD, and comes wrapped up in a very elegant oversized heavy grey die cut card sleeve held together with a rubber band enclosing only a very large poster sized sheet of text written in French but not containing any details about the music. Until I had played the disc a few times I had not noticed that there is indeed identifying text on the card sleeve, but it is not printed, rather embossed (or what ever the opposite of embossing is?) into the rear of the sleeve, so it took some noticing. Most embarrassing of all was once I read the text I realised that I had actually bought this CD online, having been attracted by the sleeve design as well as the potential of the music. I had just forgotten doing so… the CD in question then is a collaboration between Gilles Aubry, who provides the music here, and Stephane Montavon who wrote the text printed on the accompanying poster. 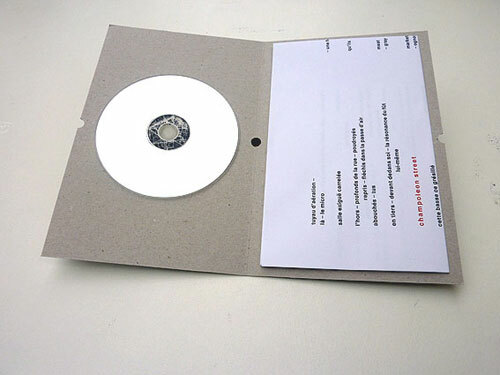 The CD was released recently as part of a field recordings series on the German Gruenrekorder label. More photos of the project can be seen here. For the most part, Aubry’s music has a very claustrophobic, almost oppressive feel to it. In the notes at the website it is mentioned that recordings of enclosed spaces were mostly used, not necessarily all indoors, but tight often highly populated areas such as market spaces and busy courtyards. He also mixes in closely recorded home appliances, a fridge appearing in a few places amongst other hums, rattles and and buzzes. So quite a bit of the time its probably easy to be able to tell what this music sounds like. Interestingly (and you will have to just believe me here as I can’t prove otherwise) I noted an North African feel to the sounds before I knew what it was I was listening to here. Perhaps the odd voice gave things away, or the gaggle of massed voices we often hear, usually in the distance, I was reminded on Dan Warburton’s album of Moroccan field recordings he released some time last year. In places the treatment of the sounds works very well. In the first half of the album a long passage of layered traffic sounds, honked car horns and revving engines all layered and maybe looped over each other into one seething mass of tension is very nice, and elsewhere the use of superimposed sympathetic layers gives a physical depth to the music that is a lot of fun to listen vertically down into, picking apart the various different sounds. On the other hand, in places the use of looping can be far too obvious and somewhat annoying. A continually looped distant voice calling something unintelligible on the second part of the recording just doesn’t work at all, and spoils the bulk of this second. The use of this sample like this brings rhythmic sensibilities into the music that do little for me. Elsewhere though there are some very nice moments. At the end of the first part there is a lovely, extremely subtle section where the heavy layers of sound are peel back and a young voice is heard, strangely altered in tone as if it were recorded over a telephone line, but with a particular charge to it when it appears from underneath the more dense sections of the music. The second part ends with a similarly well considered ending, again the more tightly packed sounds cut away to leave a hissing, rushing sound that alters in texture, undercut by a loose recording of a crow calling out. The ending of these pieces seems important to Aubry. Overall this is a pretty good example of this kind of work, which in itself is in danger of becoming a little too overpopulated right now, as I seem to come across an album that works in a similar way to Les écoutis le caire just about every couple of weeks. In spots the use of loops feels a little unnecessary and I think I would probably have preferred a few simple field recordings from Cairo layered in a less complicated manner, but the intricacies of the construction reveals a degree of care and consideration here that is not always present in this kind of music. Also the mixture of sounds is usually well chosen, nice combinations of different elements that at first sound part of one another until close listening reveals more. Perhaps not the most original album in the world then, and I don’t doubt that I’ll write about a few more CDs in a very similar vein before the end of the year (If I was more cynical I could be tempted to tick Cairo off of an imaginary list!) but it is well put together with some very pleasing moments and will certainly appeal to fans of this end of the musical spectrum. The sleeve design, and accompanying poster will appeal to fans of interesting sleeve art. It made me go and buy it anyway.